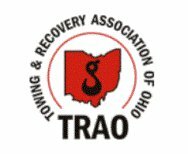 We have been an active member of the Towing and Recovery Association of Ohio since 1994 with the President of our company, Tammi Brabham serving as the Board's executive secretary from 1999-2012. TRAO is a not for profit, statewide association which was established by dedicated men and women who realized that one company could do little to alter the direction of their industry or to change many of the inequities that their industry must endure. The objectives of TRAO are to provide a means for unified effort in the solution of problems, and the administering of such action that may be deemed necessary for the betterment of the Towing industry. We have been a preferred AAA provider for about 15 years. AAA is a membership organization providing Road Service, Travel, Discounts & More to consumers who obtain a membership for services. Our role is to provide towing, battery service, lock-outs and spare tire mount to AAA members. For membership information, please click the AAA logo. If you would like to use your AAA membership for roadside service at this time, please call 1-800-AAA-HELP (1-800-222-4357). The Rotary is a very important service organization. The Rotary motto "Service Above Self" conveys the humanitarian spirit of the organization’s more than 1.2 million members. Strong fellowship among Rotarians and meaningful community and international service projects characterize Rotary worldwide. We are proud to have served the Gallipolis chapter for five years. To learn more about supporting Rotary, please click the logo. We have been an active member of the Gallia County Chamber of Commerce since 1992. Additionally, Tammi has served as President, Vice President, Secretary & Treasurer of the organization, as well as participated in several COC community event committees. The Chamber is an important organization for businesses in Gallia County providing networking opportunities and community support.